We are opening the gates of the One O’clock Club and the Adventure Playground to the whole family! 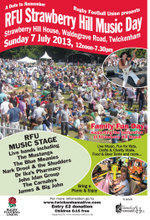 Come and join us for a BBQ, try out the rope swings and get the chance to gunge the Playworkers. Marc the guitar man will be singing and watch out for a special show courtesy of Mat. We welcome Susan Roster and her clothing business - The Secret Wardrobe, a designer dress agency to St Margarets which is now open at 22 Crown Road. Susan contacted the St Margarets Traders Association via the Looking for Premises in St Margarets page on the traders website to register her interest in St Margarets. The St Margarets Traders association were able to put Susan in touch with a local landlord who was looking for a new tenant. The previous shop remained trading at the premises whilst the paperwork was being completed and this has resulted in a seamless changeover of tenant for the landlord. A Surrey charity is staging an auction to help India’s rural poor - with a little help from Bollywood and from one of Britain’s best gardeners. Jeevika Trust, which is based in Hampton Wick, is participating in the annual Small Charity Week eBay auction from 20 to 30 June to help raise vital funds. 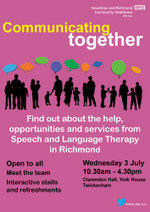 Richmond Speech and Language Therapy Service are holding an open-day event on Wednesday 3 July for parents, children and professionals to drop-in and find out more about the services the team provides. People in the borough who work tirelessly to help improve the quality of lives for others can now be rewarded via the Council’s new mini ‘honours’ scheme, the Richmond Community Awards. Last Week Richmond Council launched its new Village e-Newsletters - localised email updates that are sent to over 25,000 residents. As well as council updates, they also showcase the work being carried out by local community groups or individuals and let people know how they can get involved.